A self organised unconference for anyone with an interest in services in islands, wherever they may be (including the big one with Cardiff, Edinburgh, and London on it); and for anyone with connections to islands, however tenuous. Also (in May 2012 and May 2015), an opportunity for visitors to Orkney to see puffins! What will happen at IslandGovCamp? 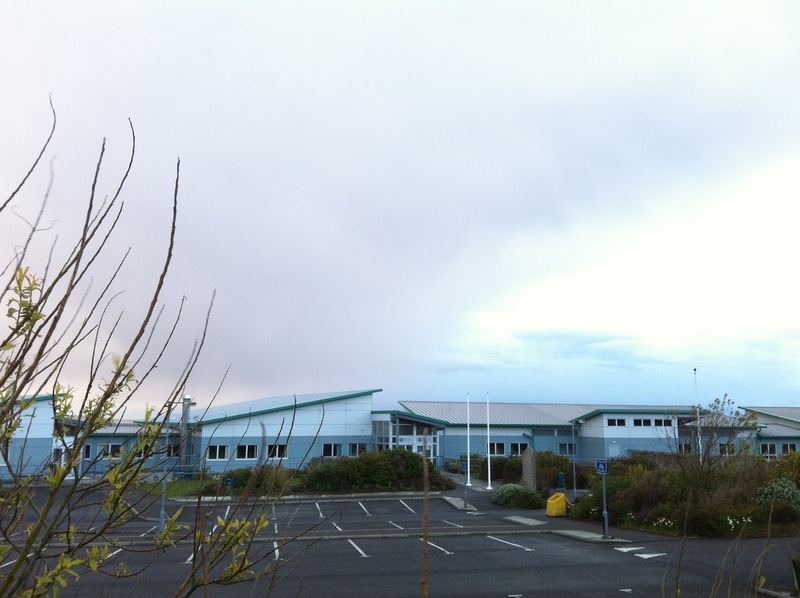 Friday 29 May 2015: Those who wish to might spend the day discussing possible govcamp topics, either online or in Orkney (or even while travelling to Orkney!) If you do travel to Orkney to take part in person, in the room, Friday would be a good day to explore the Orkney mainland (and possibly another island or 2), possibly taking in Scara Brae, the Ring of Brodgar (and other UNESCO-designated Heart of Neolithic Orkney sites) and the Italian Chapel. The intention is to crowdsource a tour itinerary among those who wish to do some exploring together - we'll probably need to do this online in advance of people arriving in Orkney. (Probably some Orkney-resident govcampers will have to work on this day, and some visitors will just be arriving from Shetland or south, but those who wish to can interact online with some of these activities, and join in in-person when they can). In the evening, perhaps we can spend some time in further discussion in some suitable place, perhaps some of Kirkwall pubs (for example Helgi's, the Bothy Bar or The Auld Motorhoose). Saturday 30 May 2015: Probably some visitors will still just be arriving on boats and planes. Those who are participating online won't have much to do until shortly before 1200BST (and they certainly won't get the lunch that will be in the room at that point!). Those who are in Orkney, and wanting to be in the room, will gather from 1200BST onwards at Kirkwall Grammar School, where lunch will be available. We'll use an hour or so to decide what sessions there are going to be, and in what order (in our version of the standard govcamp session pitching process), and then those sessions can run until about 1800BST. In the evening, there will be more discussion, probably with the addition of food (and music, and your choice of wine, whisky, beer, or other drinks) for those who wish to. 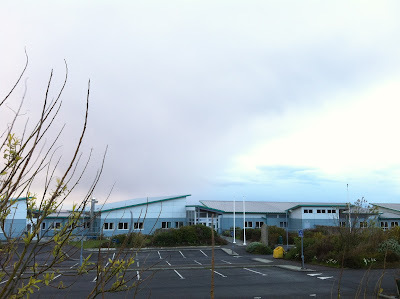 Sunday 31 May 2015: At 1000BST (or thereabouts) we will gather again at Kirkwall Grammar School (and online), and have coffee and more govcamp sessions and/or some sort of general question/answer/discussion time until about 1300BST, when we will have lunch. We will also do something a bit more active (in 2012 it was cricket) in the afternoon, for those not rushing home. From then on, those who have to travel home get on their way, and those who live in Orkney can attempt to recover before work on Monday! Tickets for the lunches and govcamp sessions will be free: depending on sponsorship and funding, other parts of the event might also be free! (HINT: if you can think of possible sponsors, or would like to provide sponsorship (in cash or in kind) please get in touch!). Unfortunately, it does not seem likely that assistance with travel and accommodation will be possible - but as the event includes a Saturday night, perhaps the cost of getting here will not be too prohibitive. For anyone who cannot travel to the IslandGovCamp venue on the days of the event, it will be possible to participate over the internet from wherever you are. There will be audio and video livestreaming of as much of what goes on as is possible, and you will be able to ask questions and make comments from wherever you are via twitter.We may be able to provide other digital options for interaction with the event, and are open to suggestions about how to attempt this. Further advice on travel options, and on finding accommodation, will appear here soon. Where did the idea for IslandGovCamp come from? It was inspired by ScotGovCamp in Aberdeen (and TechMeetUp in Aberdeen, and SOCITM Scotland in Edinburgh) in September 2012. GovCamps have been held all over the world in recent years, as indicated in this incomplete wiki list. Govcamps grew out of the concept of BarCamps, and tended at first to have a focus (if that is the right word!) on the pragmatic use of social media and technology to improve public services - more recently the focus has shifted to digital design, innovation and co-production. The important thing about this style of event, though, is that the agenda is set by those attending, with a bit of prior discussion and debate online. It is also the latest in a string of Orkney technology-related events facilitated by members of the Orkney ICT Forum, since 2002. Anyone! There will soon be a link to an online booking form, and it will be first come, first served. (The only limit will the maximum number of attendees we are able to accommodate at the venue, and the amount of sponsorship or funding available to pay for the lunches. It doesn't matter if you are a technical expert, a front-line public sector worker, a manager, support staff, a contractor, a private citizen, a service user or anybody else - if you have an interest in discussing service improvements with likeminded people, IslandGovCamp is for you! It is hoped that a good mix of Orkney residents, and other islanders (even from that big one with Edinburgh, London and Cardiff on it) and others with an interest in island life will be able to take part. Unfortunately, IslandGovCamp 2014 (which was planned for September 2014) will NOT now be happening. If you had registered to attend, you should already have received an email with the bad news. Apologies to all who were interested in attending - perhaps we can get something organised some time in the future. This first post-#IsleGC12 post has a simple aim: to think back to what I hoped #IsleGC12 might be, and reflect on the extent to which I now think it fulfilled that hope. Apart from my thoughts and impressions, there is a mass of actual data following #IsleGC12 - tweets, blog posts, email, feedback questionnaire material, and other things - most of it produced and drawn together by other participants in #IsleGC12. This deserves detailed and careful analysis and consideration; another post with links to the work on this that others have already started will appear soon. Over the coming weeks to play my part in this effort, I promise (against my nature!) to force myself to step back from the many other exciting things happening at the moment - some of them directly made possible or inspired by my participation in #IsleGC12 - and to make sure I reflect and contribute to this effort, so that the #IsleGC12 experience is shared in a form that might be useful to others in the future. During the 4 weeks or so since participants started arriving in Kirkwall for #IsleGC12, and we all started detailed preparations for how the event was going to organise itself, the thoughts and impressions about what it all means have been coming thick and fast. I think this is due to my relative inexperience with the unconference format, so my wonder and delight at the positive, self-organised, collaborative approach is strong - and perhaps even more keenly felt because I was learning about it at home in Orkney in (for once) glorious weather! In short, there is so much blog posts material available on so many aspects of #IsleGC12 that I may never need to think of another topic for years! So what did I hope #IsleGC12 might be? I thought At one level, I took completely at face value that a govcamp will be what it will be, that the right people to be there are the people who are there, and that willing participants will organise themselves to make sure that the discussions and activities at the event are valuable and engaging. I'd previously attended only 2 events calling themselves govcamps (both in Scotland).The first - scotgovcamp2 (held in Aberdeen in September 2011, and arranged by individuals working in the public sector in, and sponsored by Learning Pool and others) - seemed to me to be a brilliant example of interactive collaboration, positively engaging people from a wide range of perspectives, and focussing on pragmatically helping to make progress on issues of importance chosen by those present. The discussion and debate around the merits and flaws of the second - GovCamp Scotland (held in Edinburgh in November 2011, arranged and sponsored by a consortium including Microsoft, the Scottish Government, Cisco, Sopra Group and others) - helped me understand that there is probably a rich variety of govcamp events, forming a spectrum with something very close to a purely social occasion at one end, and something even closer to a traditional conference at the other. The original idea for #IslandGovCamp was literally an ironic joke (this is a weakness of mine! ): it struck me in Aberdeen last September that if there can be UKGovCamp and a scotgovcamp, why couldn't there be an OrkneyGovCamp? After all, every year in Orkney a huge number of community-organised events are staged - from the serious and world-class such as the St Magnus International Festival (the 35th of which is just getting underway as I write) and the Orkney Folk Festival, to the locally focussed such as Stromness Shopping Week, the Westray Regatta and the Orkney District SCDA Festival of One-Act Plays. I will blog in the future about the fantastic social and (non-digital) technical infrastructure that has evolved in Orkney over the last 30 years, which has led (I believe) to Orkney being one of the most agile and flexible communities in the UK when it comes to facilitating events large or small - as long as everyone can afford the time and the plane fare to get here! A govcamp struck me as being - in essence - an Orkney festival, without the necessity of booking any artistes, with only 1 venue, and the running order for which would be organised by those attending. That did not seem a daunting prospect for someone like me to arrange! As I waited on the ferry in Aberdeen, the day after scotgovcamp2, I started to think about which weekend, in the crowded Orkney events calendar, could possibly accommodate something new. Orkney has a population of around 20,000, only a certain (quite small) number of people, venues, bed & breakfast providers, ferry & plane tickets and so on are available on any given day! At the very least, any #IslandGovCamp would need to avoid the dozen or so biggest events each year. But hang on - who on earth would even be interested in attending a govcamp about Orkney? Maybe it would be better to expand the scope a bit. Which existing model should I pick, to suggest the expanded scope for my theoretical event? Several options (some of which I've been personally involved in establishing) sprang to mind: the Scottish Islands ICT Forum, established in 2006 to facilitate collaboration between ICT professionals within Scotland's 3 island authorities (Comhairle nan Eilean Siar, Orkney and Shetland); the Pathfinder North partnership of councils in the Highlands and Islands area, which came together under the leadership of The Highland Council to specify and procure symmetric uncontended broadband links to all local authority sites in the Highlands and Islands area; the Scottish Region of Socitm, which provides a "safe space" for all public sector and third sector web and ICT people to share experience and provide mutual support; the (now defunct) Glow Mentors network, providing support to teachers in all schools in Scotland in the take up and use of the Glow intranet - the list is endless. In the end, the name #IslandGovCamp came into my head, and I realised that what might distinguish this (still theoretical) event should be that it would look at all the same stuff as other govcamps, but from an island perspective, and in an island setting. Then (still waiting for the ferry to depart from Aberdeen to Kirkwall) I had an idea about how to have a bit more (still theoretical) fun with the concept: I created a twitter account and started spamming everyone I thought might be amused with an ironic consultation exercise: *If* there were to be an IslandGovCamp event in Orkney in 2012, which month would you like it to be held in? My vote was for September, to coincide with the Orkney International Science Festival (it would have been a wonderful synergistic fit! ), but within hours there was an overwhelming consensus (led by Mary McKenna, of Learning Pool) that the event (which would never happen, I was fairly sure of it) should happen when there was a chance of seeing puffins in Orkney. I'd be lying if (at that stage) I really knew when that is, in any detail, but what was clear was that there was an appetite for the event to an extent I never imagined possible, so I started to downplay any notion of it ever coming to be. How, after all, could it? I will blog (another promised future post) another time about the detail of how this ridiculous idea turned gradually into #IsleGC12, 25-27 May in Orkney (and on the internet). Suffice to say, that a number of different factors all combined in the right way to make it possible. Also, 3 or 4 individuals encouraged and supported the idea (and me) in practical (and psychological) ways that I will always be grateful for. Many others were enthusiastic about taking part, and that is the real reason why it happened, of course - like any other govcamp or unconference (or, in the end, like any other event, perhaps - discuss!). It has long been said that THE. MOST. IMPORTANT. issue for islands is transport. Moving people and things into and out of a community surrounded by water is much more expensive, time-consuming and complicated than moving people and things in and out of (most) communities which are not so surrounded. Since the earliest days of hype around pervasive digital communications, Orkney has attempted to use digital technology to provide options (in certain circumstances) other than physically travelling from one place to another: this started (I claim) around 1990, with BT's vision for how ISDN would transform our lives. Of course there is a long history of analogue and radio communications predating this; technologies such as broadcast radio and the telephone were developed in different ways (and in a different age) in arguably successful attempts to do the same thing (let's leave aside entirely the development of steam and the internal combustion engine, and arguments about how roads, railways, and lifeline ferry and air services should be provided to the various communities in Scotland and beyond; but, in this context, they are chapters of the same story!). For 15 years, I (and others in the islands) have been attempting to interest organisers of events to facilitate (where appropriate) remote attendance (one shorthand for this, nowadays, is "by webex or similar") at events we cannot otherwise ever hope to attend with our peers based on the big island with Cardiff, Edinburgh and London on it. I can get "very assertive" (and not in a particularly admirable way!) on this topic, as many readers of this blog will know. Over the past year or 2, with the advent of webcasting and mainstream usage of webinars for sales and other commercial purposes, I have sent an average of 3 emails a week (to organisations such as Socitm, Holyrood Events, Headstar, NextGen Events and many, many others) in response to "invitations" to "exciting" events, politely enquiring if I can follow or participate in the event remotely. Very recently (within the last 3 or 4 months) some of these emails have received more encouraging responses than a flat rejection. (Some of these events really do look exciting, by the way - essential even - but that still doesn't mean that it is affordable to attend them from the islands!). One or 2 events (Digi 2012 and BlueLightCamp) stand out as being both brilliant, and accessible by webcast and twitter-or-similar! provide an opportunity to encourage as many people as possible, who could not travel to the venue in Orkney (for whatever reason - money, time, health & mobility issues, family commitments, etc, etc, etc - it's not all about islanders!! ), to try remote attendance for themselves. a vague notion that the festivals and arts organisations of Orkney could benefit from "digital"
Do I think we collaborated successfully around #IsleGC12 to make some progress on these things? The short answer is this: Yes, beyond my wildest hopes or expectations! Some people have urged me to stop saying thank you all the time, but I seriously doubt I will ever be able to! Thank you, everyone! Thanks to everyone who participated in #IsleGC12 , either remotely over the internet or here in Kirkwall. As the weekend's events turn from hectic reality to slightly gentler memories, I hope we can keep up the momentum and make sure that we all keep collaborating with any willing partners in the use of readily available technologies (including social media) to sustain and develop services (public, private and third sector) in our various island contexts. We were very fortunate to have contributions from Sue Wells of Christchurch, New Zealand (over the internet), and from Jan Walburg of Bureau Walburg, based in Friesland in The Netherlands. Sue's reflections on the experience so far of the hugely destructive earthquakes recently to have utterly transformed the city of Christchurch, and Jan's smartC4RE ideas (which we hope will result in developments and improvements in the use of technology for social care and health), added another dimension to the event. It was also great to have Duncan McKenzie of Northern Constabulary as a direct link to the #BlueLightCamp community, with #northernBLCamp , at Kirkwall Police Station (and on the internet) on Saturday morning. It is to be hoped that these contacts (among many others) will produce lasting results over the coming months and years. The list of specific thanks is very long, so let's adopt our habitual bulleted list, and hope that we don't miss anyone out. Blue Light Camp - including Sasha Taylor and others, from which (along with ScotGovCamp) many ideas and principles were "borrowed"
The IslandGovCamp 2012 weekend begins tomorrow, there are various things you need to know to make sure that your remote attendance works as well as possible, allowing you to engage and participate fully in #IsleGC12. We are aiming to strike a good balance between the needs of remote attendees and those of the people who will be in Orkney in person for the event. To enable effective remote participation, we might need to have a few more ground rules for those attending in person than is normal at a govcamp. On the other hand, we do not want to over-structure the discussions in the room, as one of the good things about the govcamp format is that it is very flexible, and avoids over-structuring discussions. So, we need organisation and structure to make sure that those attending remotely can follow what is going on, but we need informality and flexibility to make the most of the whole event; we will need to try to balance these competing aims, and we will not get it right 100% of the time. This element of #IsleGC12 is new and experimental, so please let us know about the problems and difficulties you will encounter. All announcements, administration and important information will be given via @IslandGovCamp and #IslandGovCamp. If you have any problems, comments and enquiries about administrative and technical issues, tweet @IslandGovCamp. To avoid swamping this important information (especially for remote attendees), the hashtag #IsleGC12 (along with the event-specific hashtags, see below) is intended to be used for all discussion about the content of sessions (or any other discussion) between attendees. Sessions will take place on Saturday afternoon and Sunday morning. 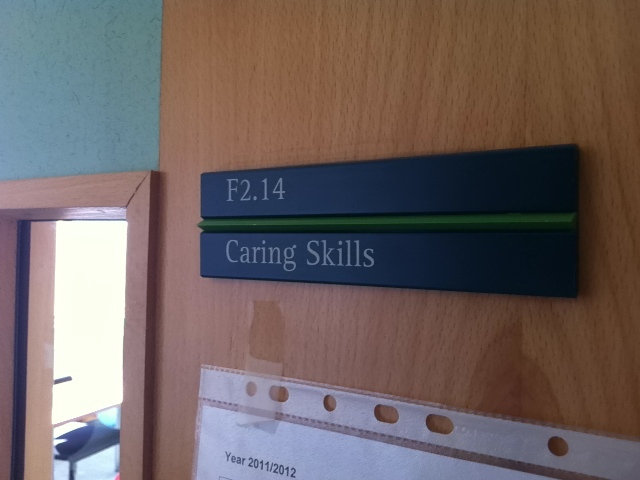 We have four rooms available at Orkney College for sessions. Which sessions take place, and in what order, will be decided between 12.00 and 13.20 on Saturday; we will take all the ideas submitted on IdeaScale and any suggested on the day to this “session pitching” process. Because the session topics have not yet been decided, the hashtags for each scheduled session (1 hour each) have already been allocated by time and room location (see the table below). The topics for each session will be entered into this table, will be posted on the Blog, and will be tweeted, as soon as the planning session has finished (approximately 1320). Before every subsequent session there will be a 5 minute warning announcing the next session to take place in each room and the corresponding hashtag (and a reminder link to the full schedule). When each new timeslot actually begins, this will be repeated. A dedicated hashtag (e.g. #papay3). This is for all discussion related to that session. A volunteer 'Twitter Monitor', in person in the room, to act as spokesperson for remote attendees at that session. (The Twitter Monitor will follow the session hashtag for comments and questions. All other in-person participants in the session are also encouraged to follow the hashtag, and take into account the comments of remote participants throughout the session). A volunteer 'Session Tweeter', in person in the room, to narrate (as far as possible) in twitter the discussion in the room, labelling each tweet with the session hashtag. At the beginning of each session, the broadcast link will be set up and tweeted out by @IslandGovCamp with the session hashtag. Please do not hesitate to get in touch on Friday evening, or during Saturday by email (to islandgovcamp@gmail.com). Equally, if you have any questions or comments before or during the sessions, please tweet them if you'd rather (mentioning @IslandGovCamp and/or the #IslandGovCamp hashtag). We are all looking forward to a great event, which we hope will be interesting and entertaining. Let's hope it all works! Hello all attendees, both remote and in person! We are almost there, and with that we have a finalised schedule for the IslandGovCamp weekend (see below). On here you can see the times and places you need to be along with any vital extra info. Tomorrow, we will be sending out an email to remote attendees with specifics on how the broadcasting and remote discussion will be structured (e.g. 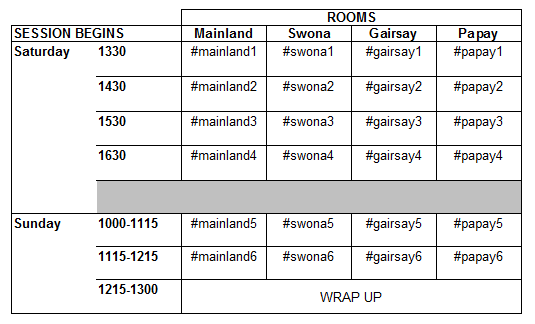 which twitter hashtags to follow, where to get admin info, when streaming links will appear, etc), along with suggestions for facilitating interaction in the IslandGovCamp sessions (In person attendees will be given all this information when they arrive at Orkney College on Saturday). In the meantime, keep an eye on #IslandGovCamp and @IslandGovCamp on Twitter and posts on this blog for administrative updates, and get ready for an exciting weekend! For 1000 Guided tour of Maeshowe. 1420 Tour of St Magnus Cathedral by Fran Flett Hollinrake. Toilets available. 1630 Lamb Holm Walk to Italian Chapel. No toilets. 1200 - 1730 IslandGovCamp planning and sessions. Coffee served throughout. Toilets. 1000 - 1300 IslandGovCamp sessions, coffee available throughout. Toilets. 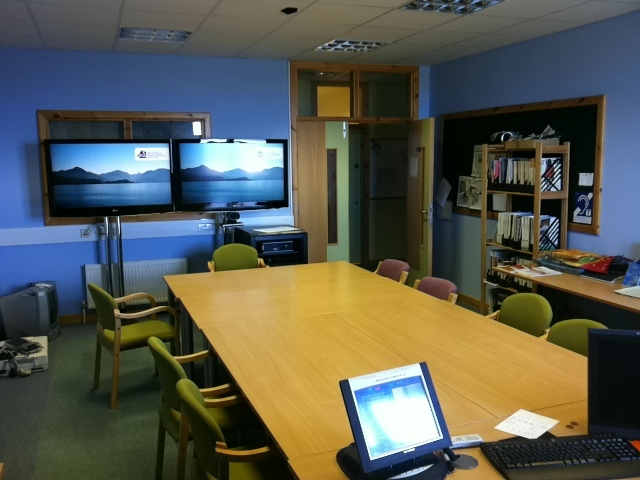 We've had some thoughts about how to use the space available at Orkney College UHI, and how to ensure that remote attendees can follow all the sessions with as much prospect of seeing and hearing what is going on as an in-person participant will have. If you have any thoughts on this, or can offer to assist in making all this happen, please leave a comment below! Remote attendance will principally be by means of Cisco Webex.